Ultra-class armor refers to several types of armors utilized by the former Covenant empire. They are of a glistening and fearsome white, and signify the individual's renown. The Ultra-class armor is not limited to Covenant infantry of the Ultra rank. It may be available to various species and ranks, and may correspond to various types of harnesses. 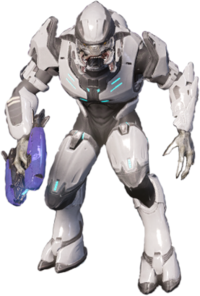 Sangheili harnesses that may be rated Ultra-class include the silver-colored combat harness, the ornate Ultra harness variant, the Honor Guard Ultra ceremonial armor, the silver-colored Zealot ceremonial battle harness, the silver-colored Storm harness, and the silver Commander-class harness. Unggoy harnesses also comprise a variety of Ultra-rated suits: the silver-colored base combat harness (usuable by Ultras, and less frequently by Majors), the harness for the Unggoy Ultra rank, the SpecOps harness (also usable by Ultras), and the Bodyguard harness. Other species also have access to Ultra-class armor, such as the Yanme'e, and the Mgalekgolo. Curiously, Jiralhanae of Ultra ranks—Ultras, Captain Ultras, and Jumper Ultras—do not wear silver-colored armors, instead sporting blue or golden armors. Some Yanme'e Ultras may also wear green armor, instead of their silver-colored exoskeleton. Thus, not all Covenant who wear Ultra-class armor are Ultras, and not all Ultras wear an Ultra-class armor. In the Spartan-IVs' Warzone combat training, Mythic Covenant bosses sport a white Ultra-class armor, and are the toughest Covenant AIs in the simulation. In Halo: Reach's level ONI: Sword Base, there are Easter egg "BOB" Elites featuring eight types of special white harnesses. Since the golden Sangheili Ranger BOB has been canonized into the Sangheili Ranger Commander and a number of the white BOB harnesses also exist in-universe, it is possible all said harnesses also exist canonically. An ornate Ultra-class Sangheili harness. A great number of white-colored Sangheili harnesses. An Unggoy Major in Ultra-class combat harness. A Zealot in Ultra-class ceremonial battle harness. An Unggoy Ultra in an Ultra-class SpecOps harness. An Honor Guard Ultra, also known as Light of Sanghelios. A Sangheili Commander and a Mgalekgolo in Ultra-class armor. An Unggoy Bodyguard in Ultra-class harness.